I had finished up reading John and needed a reliable commentary. My folks got me this one by R.C. 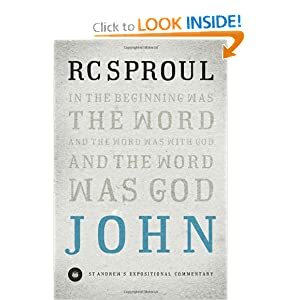 Sproul (at my request - Amazon and CBD reviews are very helpful in researching good books) for my birthday in June. Friends, are you looking to be taught, rebuked, corrected, and trained in righteousness (2 Tim 3:16)? This book is for you! This collection of sermons adapted to print will inspire your faith, lead you to repentance, and feed your soul and mind as you study the person of Jesus in John's gospel. And I conclude with a zinger in his commentary on John 5: 1-15. Thanks for the recommendation, and the preview quotes! I love that you used the word "zinger".